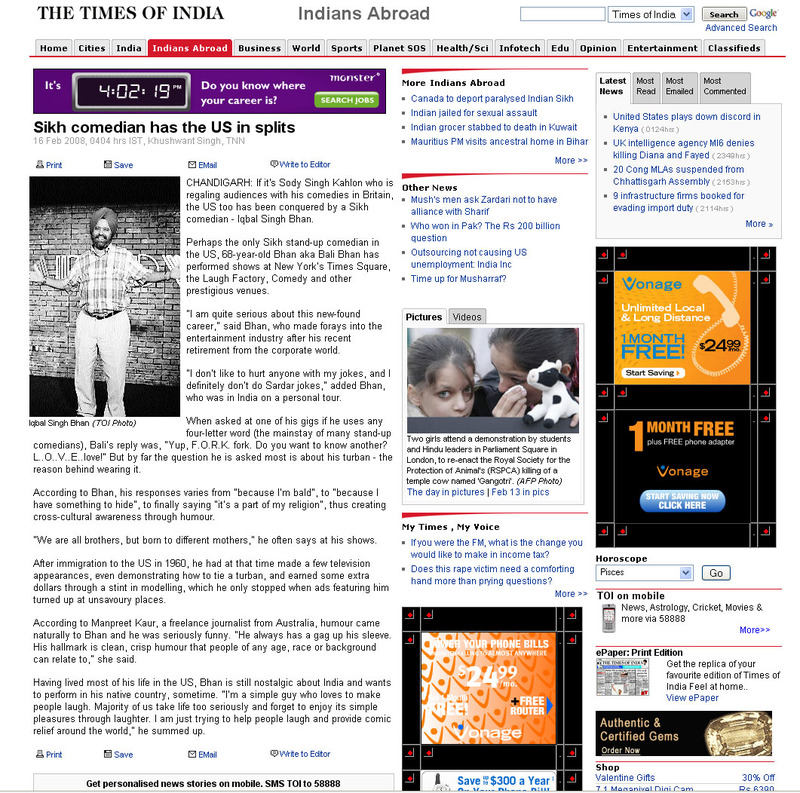 CHANDIGARH: If it’s Sody Singh Kahlon who is regaling audiences with his comedies in Britain, the US too has been conquered by a Sikh comedian – Iqbal Singh Bhan. Perhaps the only Sikh stand-up comedian in the US, 68-year-old Bhan aka Bali Bhan has performed shows at New Yorkâ€™s Times Square, the Laugh Factory, Comedy and other prestigious venues. “I am quite serious about this new-found career,” said Bhan, who made forays into the entertainment industry after his recent retirement from the corporate world. “I donâ€™t like to hurt anyone with my jokes, and I definitely donâ€™t do Sardar jokes,” added Bhan, who was in India on a personal tour. When asked at one of his gigs if he uses any four-letter word (the mainstay of many stand-up comedians), Baliâ€™s reply was, “Yup, F.O.R.K. fork. Do you want to know another? L..O..V..E..love!” But by far the question he is asked most is about his turban – the reason behind wearing it. According to Bhan, his responses varies from “because Iâ€™m bald”, to “because I have something to hide”, to finally saying “itâ€™s a part of my religion”, thus creating cross-cultural awareness through humour. “We are all brothers, but born to different mothers,” he often says at his shows. After immigration to the US in 1960, he had at that time made a few television appearances, even demonstrating how to tie a turban, and earned some extra dollars through a stint in modelling, which he only stopped when ads featuring him turned up at unsavoury places. According to Manpreet Kaur, a freelance journalist from Australia, humour came naturally to Bhan and he was seriously funny. “He always has a gag up his sleeve. His hallmark is clean, crisp humour that people of any age, race or background can relate to,” she said. Having lived most of his life in the US, Bhan is still nostalgic about India and wants to perform in his native country, sometime. “Iâ€™m a simple guy who loves to make people laugh. Majority of us take life too seriously and forget to enjoy its simple pleasures through laughter. I am just trying to help people laugh and provide comic relief around the world,” he summed up.